Build on knowledge of the industry’s responsibility to NRM within a catchment context. This national program integrates environmental activities at a national, catchment and individual property level. The key outputs include the Guidelines for Environmental Assurance in Australian Horticulture and the Horticulture NRM Strategy. Horticulture for tomorrow is a benchmark for HAL due to its success in delivery, evaluation and raising awareness of the environmental issues facing horticulture in Australia. The program is a vehicle for building stronger relationships with HAL’s key industry Members and raising the profile of environmental issues facing horticulture both within and outside of the national horticulture industry. The program has been cited by senior Australian Government staff as an outstanding success story, especially in terms of the approach taken to building industry support and involvement, and delivering outcomes. Horticulture for tomorrow has been supported by the Australia Government through the Natural Heritage Trust Pathways to Industry EMS Program (2004-2006), the National Landcare Program Sustainable Industries Initiative Phase I (2005-2007) and Phase II (2007-2008), Landcare Australia (2008-2010) and more recently with funding from the horticulture Across Industry Committee (2013-14). The $1 million national Environmental Assurance (EA) Project was the first phase of the Horticulture for tomorrow Program, funded by the Australian Government and delivered by HAL. The project was completed in June 2006 and delivered a number of workshops, an introductory guide to environmental management and the first edition of the Guidelines for Environmental Assurance in Australian Horticulture. 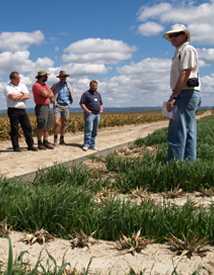 This project delivered the national Horticulture NRM Strategy in 2007 and established a number of Industry NRM Groups around Australia to design, record and initiate complementary programs for on-farm change. The project emphasised horticulture’s role as a responsible manager of resources and built on the knowledge of the industry’s responsibility to NRM within a catchment context. This project delivered a series of regional case studies and an industry NRM forum. It targeted building on the work successfully undertaken in the NRM Initiative and focusing on ensuring industry engagement and understanding catchment scale activities. Completed in 2014, this project delivered the second edition of the Guidelines for Environmental Assurance in Australian Horticulture and the revamp of this website. This included the addition of a new section on Climate Adaptation.